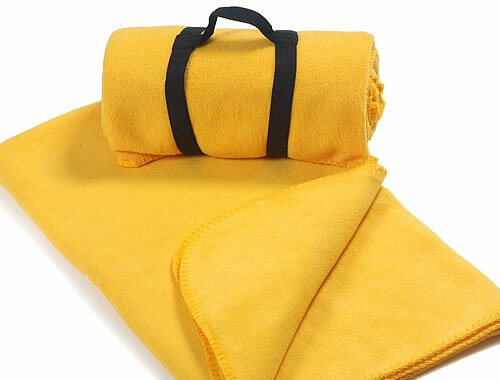 Fleece blankets have become very popular over the past few years. There are many reasons for this, including their softness, comfort, high insulation value, light weight, and the ease in which they can be customized to promote businesses, teams and products. Besides keeping you warm, fleece blankets can easily double as a pillow or cushion at home, in the car or at an outdoor event. They can also come with travel straps and fold to a compact size to easily take anywhere. These are the same reasons why so many companies are using fleece blankets to effectively promote products and logos, along with the fact that - when compared to cotton or wool - they’re very inexpensive. Embroidery is commonly used to decorate and personalize fleece blankets. Embroidery thread comes in a wide range of colors, so that the colors in the design or text can easily coordinate with any color fleece blanket.